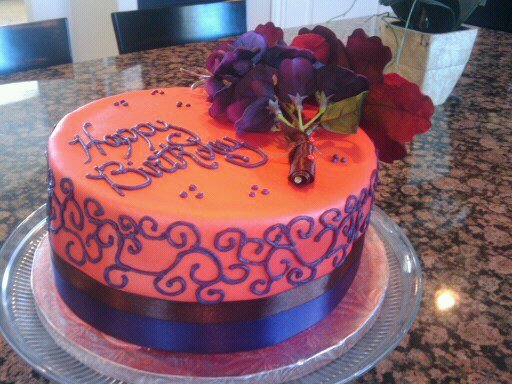 This is my step mothers birthday cake, it was autumn orange buttercream inside with white cake and orange fondant with dark purple scrolling on the outside, topped with some fall flowers. This is a princess cake for a friend. It is a Cherry Chip cake inside with pink buttercream frosting flavored with almond and cherry, covered by pink fondant which was then covered by clear cake glitter and topped with a crown and diamond jewels (although they didnt show up very well in this photo).